When it comes to good Feng Shui it doesn’t take much to really nail it. A few months ago I did a class at the local library on how to Feng Shui your front door and I remember the library coordinator raising an eyebrow as if it wasn’t possible to talk for a full hour on one small topic. While each area of our home does hold many nuances, making it easy for me to go on and on about one micro topic, that doesn’t mean it needs to be difficult. One area of the home that is really important to a homes vitality is the front door. This is the mouth of Chi, where all good energy enters and rejuvenates your home. After I did the class at the library I followed it up with a blog post which you can find here. Today I’m going to focus on the door mat but another key element is the door bell, so be sure yours isn’t in really bad shape. Is it wider than the door? This photo above is a great example of scale being off. 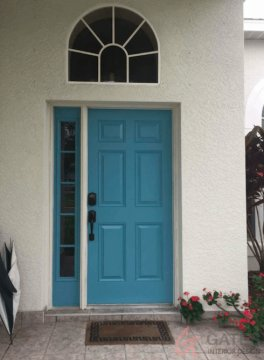 The blue door calls in great energy and is inviting, however the two story entry way combined with a very small doormat makes the space feel funny. 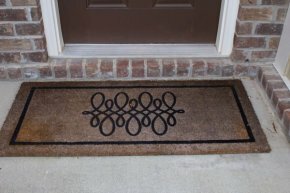 In addition, the doormat is smaller than the width of the door, making it feel cramped in an otherwise grand space. Confusing for sure. In this situation I told this client to get a new mat that was wider than the door, and larger in size to fit the scale of the space. This creates a perfect yin yang space. This is an example of a rug that is the correct scale, however it looks dilapidated! This is my front porch. I bought this rug three years ago and I love it. It was larger than the door and the scale was perfect. Unfortunately, it has seen better days. After cleaning it many times and caring for it, it was time to purchase a new one. Pay attention to how your front porch looks. How does your rug look? Is it the right size? Is it pretty and welcoming? 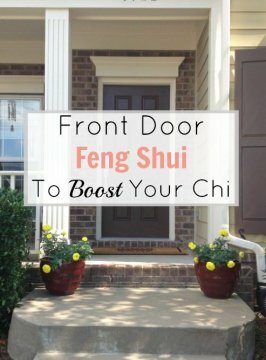 If not it’s time for some updating to Feng Shui your front door to boost your Chi!